#7205 Cuddler Cuties "Tim Tennis"
Description: Tim Tennis is one of the Cuddler Cuties Smooshees sets that were sold with a human-type Smooshee figure, a removable one-piece outfit, and a bag that the Smooshee can be smooshed into. This set was designed for children ages 4 years and older. FPT14967 - Tim - Small stuffed Smooshee boy with printed brown hair, printed facial features, and printed clothes. Tim has black dot eyes, a round red nose, and a red line smile mouth. He has an orange tank-top shirt with red "stitch" around the neck line, and he has blue and white striped trunks. He has red printed tennis shoes with white printed laces, and white pads on the bottom. *See "Variations" below. FPT14968 - Multi-colored square pattern shorts. *See "Variations" below. FPT14969 - Yellow bag with two red 1/8" wide satin ribbon straps that wrap around the sides and form 2 looped carry handle on the top. A Smooshee can be smooshed inside the bag. 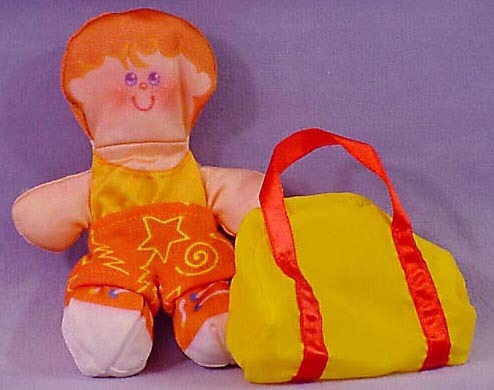 FPT14979 - Tim - Small stuffed Smooshee boy with printed brownish-orange hair, printed facial features, and printed clothes. Tim has blue eyes, a round red nose, and a red line smile mouth. He has a yellow tank-top shirt with orange "stitch" around the sleeves and neckline. He has blue and white striped swim short (or underware?) with a yellow "S" Smooshees trademark symbol on the front. He has orange and white printed tennis shoes with white printed "shoelaces" and blue "lace holes". The shoe strings have yellow printed tips. FPT14980 - Orange shorts with yellow star and squigly line outline designs.